The global blockchain technology market is developing at a rapid rate and is predicted to observe high growth in the coming few years. The increasing number of innovations and the rising awareness among consumers regarding the benefits of using blockchain technology to accelerate the growth of the market in the near future. As per a new market research by Transparency Market Research, in 2015, the global market for blockchain technology was worth US$315.9 mn and the market is projected to reach a value of US$20 bn by the end of 2024. The market is predicted to register a whopping 58.90% CAGR between 2016 and 2024. The adoption of blockchain technology helps in creating a transparency and simplified the business processes, owing to which, the market is predicted to observe a high growth in the next few years. In addition to this, the increasing popularity of blockchain as a service and the low cost of ownership are estimated to encourage the growth of the global blockchain technology market in the next few years. On the other hand, the changing regulatory status and the non-availability of a common set of standard are likely to hamper the growth of the overall blockchain technology market in the next few years. Nonetheless, the increasing adoption of the blockchain technology for smart contracts, payments, and digital identities is estimated to offer potential growth opportunities for the market players in the near future. The global market for blockchain technology has been categorized on the basis of application into the financial sector and non-financial sector. In the last few years, the banking sector is growing at a tremendous rise, thanks to which, the financial segment is estimated to enhance the growth of this segment in the next few years. Moreover, the increasing investments in the financial sector and the increasing adoption of blockchain technology are further predicted to enhance the market growth in the coming few years. Among the regional segments, North America market for blockchain technology is growing at a healthy pace and is likely to hold a key share of the market in the near future. The strong growth of this region can be attributed to the increasing investments for the development of this technology in this field. In addition to this, the increasing contribution from the U.S. and the rising acceptance of new technology are estimated to support the growth of the North America market in the near future. Furthermore, Asia Pacific is predicted to exhibit a favorable growth rate in the near future, owing to the rapid economic development of India, China, and Japan. Moreover, the development of the financial sector in this region is another factor propelling the market growth. The global market for Blockchain technology has witnessed a substantial rise in the last few years, owing to which the market is predicted to observe a healthy competition in the coming few years. The existence of well-known players operating in the market and the rising focus on the introduction of the new products are projected to support the growth of the market in the near future. In addition to this, the entry of new players and a significant rise in the number of strategic collaborations are projected to encourage market growth. Some of the key players operating in the blockchain technology market across the globe are R3, Digital Asset Holdings LLC, Ripple, IBM Corporation, Deloitte Touche Tohmatsu Limited, Microsoft Corporation, Chain Inc., and Consensus Systems (ConsenSys). Blockchain technology offers a secure, fast, and cheaper medium of carrying out online transaction and online transfer of information without the need of third party verification. The adoption of blockchain technology in financial services sector has gained traction. Banking sector is willing to explore opportunities which would make the banking transactions more transparent and easy to process. Increased penetration of digital technology in the banking sector has resulted in the development of easy to use online platforms and applications. This drives the need to carry out the online transactions in a secure manner. Blockchain technology eliminates the frauds due to errors and identity theft to a large extent. Hence the financial services sector has been keen in exploring the technology before undertaking a wide scale deployment of this technology. This technology can benefit industries such as music and healthcare by offering easy access and exchange of digital data of these industries over the Internet. The demand for blockchain technology is expected to increase in the coming years owing to the investments in blockchain technology startups, partnership between blockchain technology providers and financial organization, FinTech investments, and digitization across various industries globally. North America is expected to lead the blockchain technology market during the forecast period. Asia Pacific region is expected to witness the highest growth rate of blockchain technology during the forecast period. The Middle East and Africa and South America are in the early phases of adoption of the technology. The anticipated growth of banking sector in Africa is expected to support the market growth of blockchain technology during the forecast period. The blockchain technology market is compressive of a large number of startups. The growth of blockchain technology startups was aided by huge venture capital investments during the period from 2013 to 2015. The market is expected to be hit by a huge wave of mergers and acquisitions in the coming years. This research report provides an in-depth analysis of the global blockchain technology market based on type, application, and geography. The global blockchain technology market is categorized based on types into public blockchain, private blockchain, and consortium blockchain. The application segment for the global blockchain technology market are financial services and non-financial sector. The report analyzes each of these segments for the various geographies considered under the scope of the study. The report also provides technology evolution and Porter’s Five Forces Analysis for the global blockchain technology market. The report includes analysis of the factors that drive and restrain the growth of the blockchain technology market. It discusses the prevailing market trends and prospective growth opportunities in the global blockchain technology market. It provides market estimates and forecasts for all the segments in terms of revenue. Also provided in the report is a competitive landscape and market share analysis of the major players in the blockchain technology market. Based on geographical regions, the report segments the global blockchain technology market into North America, Europe, Asia Pacific, Middle East & Africa (MEA), and South America, which are analyzed in terms of revenue generation. The report provides country level revenue for blockchain technology. The U.S., Canada, the U.K., Germany, France, India, Chain, Japan, Australia, GCC, South Africa, Brazil, and Argentina are the countries covered in the report. Major business strategies adopted by key players, their SWOT analysis, and competition matrix has also been identified in the research report. 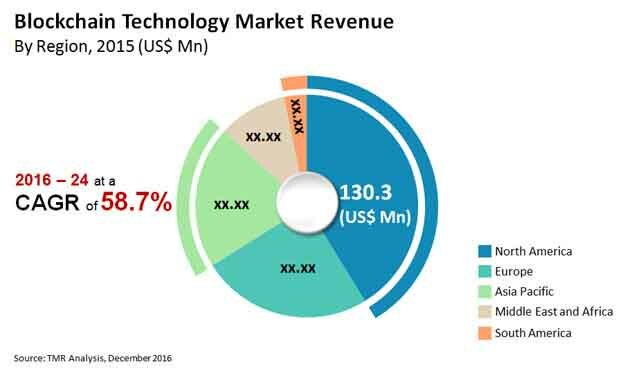 The key market players profiled in this study include Microsoft Corporation, Deloitte Touche Tohmatsu Limited, IBM Corporation, R3, Chain Inc., Consensus Systems (ConsenSys), Ripple, Digital Asset Holdings LLC, and Credits. The report has also profiled two major contributors such as Hyperledger project and Ethereum Foundation in the report.